Moon Arrow is a sculptural arrow which continually points at the moon. 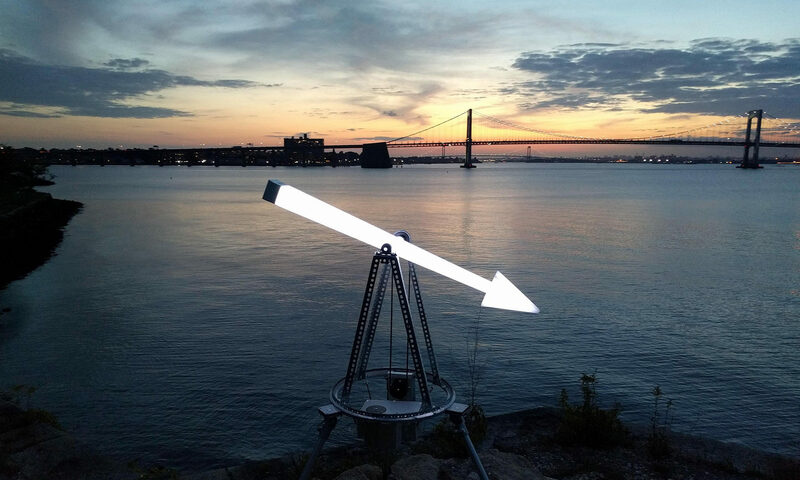 Created by artist Heidi Neilson as an Arts and Humanities Resident with the New York City Urban Field Station, Moon Arrow is installed temporarily on shorelines and other public locations and filmed in time lapse to reveal the motion of the arrow alongside the motion of tides and people. More Moon Arrow videos here. Moon Arrow installation events subject to change – this page will be regularly updated, and for the latest see twitter, @moonarrownyc. This project is made possible (in part) by the New York City Urban Field Station Arts Humanities Residency Program and the Queens Council on the Arts with public funds from the New York City Department of Cultural Affairs in partnership with the City Council. Thanks to the Amateur Astronomers Association of New York, Astoria Park Alliance, Hunters Point Park Conservancy, Socrates Sculpture Park, Tide and Current Taxi, Urban Park Rangers of Fort Totten Park, Lindsay Campbell, Bram Gunther, Nichole Henderson-Roy, Michelle Johnson, Jennifer Lantzas, Joseph Morris, Christina Perdos, Ruth Rae, Ellen Sayers, Erika Svendsen. Special thanks to Coriander Shapiro and extra-special thanks to Kim Fisher.